Download Notepad++ to your PC or windows jump-host. If you are not allowed to install the app; download the zip version. I prefer this dark theme for powercli scipts and editing config files. Place the VS2012-Dark.xml into the “theme” sub-folder of where NPP is installed/extracted. You can create the “themes” sub-folder if the folder is not there. 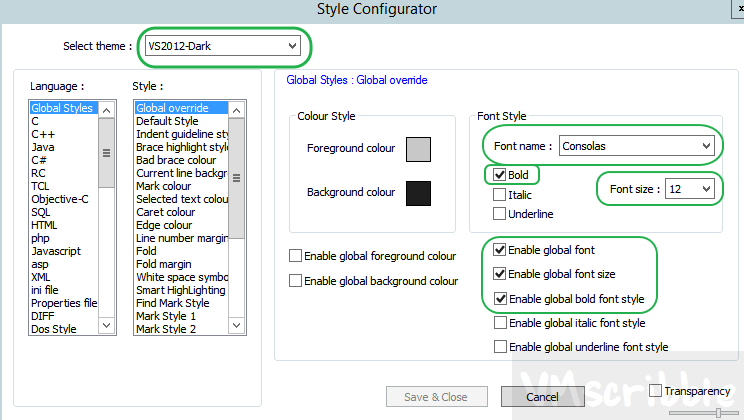 Select “VS2012-Dark”. I prefer the Consolas font, Bold and 12. To help prevent a bad copy/paste. You can see line 10 has 1 tab (arrow) before the test while lines 11-15 have 2 tabs. If there were spaces, there would be a tiny dot per space.